At First Point Fire we put the customers needs first. We will bespoke a fire safety training course to your specific industry premise, risks and budget. We will liaise with you and design for you, pictures of specific risks perhaps that you would like to highlight to employees. Our training for fire wardens and marshals has been specifically designed for those who have been allocated fire safety responsibilities within their workplace and require education in fire safety, weekly checks and practical use of safety equipment. This is a half-day course that lasts on average 3 to 3.5 hours. This includes a midway break and a Q&A session at the end. 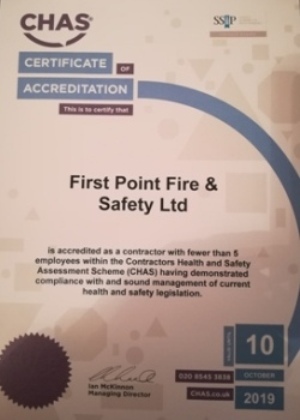 Each candidate will receive a 35 page qualsafe fire safety made easy book and certificate when attending an onsite Fire Marshal course. This course is aimed at giving candidates basic fire awareness and gives them the opportunity to have hands on experience with a fire extinguisher. This course lasts on average 2 to 3 hours but can be bespoke to your specific time frame. All on site courses include extinguishers, gas etc there are no hidden costs. There are plenty of extinguishers for candidates to use. 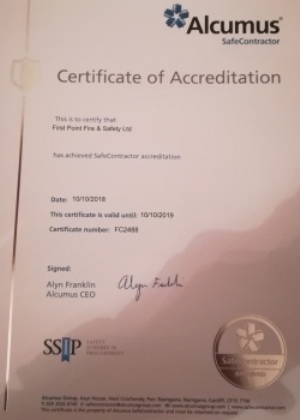 All of our on-site fire safety training courses are delivered by the Director of First Point Fire who served as an operational firefighter, we use live fire and you are guaranteed to have complete peace of mind that your employees will be trained to the highest standard. Quality and Delivery is a given. Fire safety training prices start from as little as £15+vat per person.